Players and coaches from Israeli soccer leagues meet Shas MKs to discuss end of holding games on Shabbat against players' will. 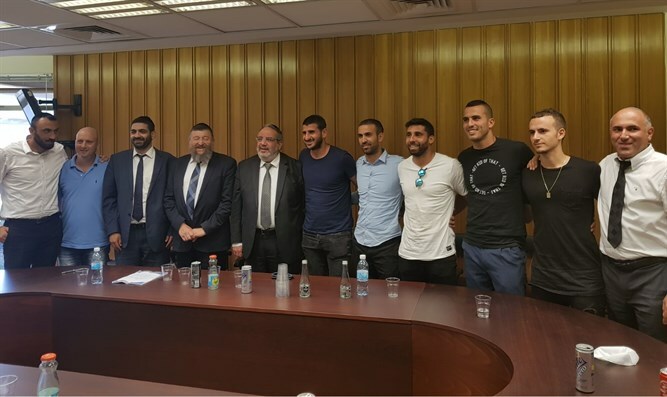 In preparation for the government's decision on the fate of sports matches on Shabbat, MKs from the Shas party met with soccer players from the Israeli premier league, as well as players and coaches from the national league Sunday. The MKs, players, and coaches discussed the need to end the phenomenon of soccer matches on Saturdays. Interior Minister Aryeh Deri was not present at the meeting, which was reportedly held at his request. MK Yigal Guetta stated that the current situation cannot continue. "This is a first-class social injustice for those players who are forced to [act in ways which] harm their families every Saturday, in addition to the desecration of Shabbat." MK Michael Malkieli said: "I came to hear the allegations. On the orders of Shas and the Council of Sages, everything will be done to honor the request of the players and prevent them from [being forced to] play on Shabbat." "If there are no games on Saturday, it will also be a day of rest for those players, and the soccer industry will also benefit economically," said faction chairman MK Yoav Ben Tzur. At the end of the meeting, the players thanked the MKs and welcomed the efforts of the Shas party to end the playing of soccer matches on Shabbat.